Hansa Jivraj Mehta, a leading freedom fighter and champion of women’s rights, was singlehandedly responsible for amending a critical feature of the Universal Declaration of Human Rights adopted by the United Nations General Assembly in 1948. The change was small, yet monumental. Bringing the notion of gender equality into a document which has become a model for liberal and sovereign democracies all over the world is not a contribution one should ever take lightly. “The world can thank a daughter of India, Dr Hansa Mehta, for replacing the phrase in the Universal Declaration of Human Rights (UDHR). It said, ‘All men are born free and equal’. Now it is changed, ‘All human beings are born free and equal’. How appropriate, how fitting it is,” said former United Nations General Secretary Ban Ki-moon back in 2015. As we celebrate Constitution Day, it’s important to remember Hansa’s remarkable contribution to the discourse on gender equality that took place in the hallowed confines of the Constituent Assembly from 1946 to 1949. On November 22, 1949, just weeks before the introduction of the Indian Constitution, each member of the Constituent Assembly gathered under the Parliament and shared snippets of this incredible journey of framing this nascent nation’s new Constitution, which took 11 sessions across 165 days. During this gathering, Rohini Kumar Chaudhuri, a member from Assam Province made a tasteless statement comparing the plight of women with cows. “We have in this Constitution cow protection to some extent, but there is no provision at all for protection against cows. There is also no provision in this Constitution for protection against women. We really need protection against women because in every sphere of life they are now trying to elbow us out. In the offices, in the legislatures, in the embassies, in everything they try to elbow us out. They succeed for two reasons: one, our exaggerated sense of courtesy, and then because of their having some influence in the ear of those persons who have authority,” said Chaudhuri. Born into affluence on July 3, 1897, Hansa’s father Manubhai Nandshankar Mehta was the then Dewan of Baroda. She went to England as a young child and studied Sociology and Journalism before returning to India. Her introduction to Mahatma Gandhi in 1918, while he was lodged in Sabarmati Jail in Gujarat, by another leading woman leader of the freedom struggle Sarojini Naidu, was a massive turning point in her life. This meeting lit the spark that would result in her joining the struggle for freedom against the British colonialists. Hansa’s decision to marry the then Chief Medical Officer of Baroda, however, did not impede her social and political activism. In fact, the couple soon moved to Bombay, and her involvement in the freedom struggle only grew deeper. As stated in this Indian Express profile, “The Servant of India,” a weekly publication of Gopal Krishna Gokhale, reported Hansa’s arrest in 1932. “Dr Jiv. ‘N. Mehta and his wife Mrs Hansa Mehta have both been taken into custody. Dr Mehta is not known to be an active politician, and his detention in jail can be explained only on the ground of his harbouring a Congress worker in the person of his wife,” the publication reported. Following her release, she got deeply involved in the political processes which would go onto define the future of Indian polity. The introduction of the Government of India Act, 1935, which called for provincial autonomy, pulled her towards electoral politics. She contested and won the first provincial elections from the Bombay Legislative Council seat in 1937. She served two terms on the council (1937-39 and 1840-49) and would subsequently join the Constituent Assembly (CA). Her inclusion in the CA’s Fundamental Rights sub-committee was particularly critical as it allowed her to champion the cause of gender equality and progressive common civil code instead of personal laws that have come to define minority religious communities today. However, she was championing the cause of women’s rights long before joining the Constituent Assembly. As a member of the All India Women’s Conference, this prolific educator was involved in the process of starting the “Lady Irvin College in New Delhi, a women’s college for home science, educational research and teacher training,” according to this Women Architects of the Indian Republic blog. She also strongly advocated the education of the girl child, besides writing many books for children in her native Gujarati, often translating famous pieces of English literature like Gulliver’s Travels and Shakespeare’s Hamlet and Merchant of Venice. Just before joining the Constituent Assembly, she was also instrumental in drafting the Indian Women’s Charter of Rights and Duties during the 1946 (and 18th) session of the AIWC in Hyderabad. Embodying the spirit of progressive politics, the charter sought among other things equality with men in terms of pay, civil rights, access to health and education, distribution of property and fair marriage laws. Nonetheless, her role in the CA would come to define her legacy. “The women’s organisation to which I have the honour to belong has never asked for reserved seats, for quotas, or for separate electorates. What we have asked for is social justice, economic justice, and political justice,” she told the Constituent Assembly on December 19, 1946. In the fundamental rights sub-committee of the CA, she worked alongside luminaries like Dr BR Ambedkar, Rajkumari Amrit Kaur and Manoo Masani, pushing for the inclusion of the Uniform Civil Code in the Constitution. She believed that it was the responsibility of the state to establish a single progressive Indian identity over the plethora of religious ones pulling in many different directions. “The Civil Code that we wish to have must be on a par with, or in advance of, the most progressive of the personal laws in the country. Otherwise, it will be a retrograde step, and it will not be acceptable to all,” Hansa said in the CA. Unfortunately, her motion to establish a UCC as a right was met with stiff resistance, even from Prime Minister Jawaharlal Nehru. “Any evil practiced in the name of religion cannot be guaranteed by the Constitution. Unfortunately, we were told that raising this question will hurt the religious susceptibilities of some people,” she said during her speech in the Constituent Assembly on November 22, 1949. Instead, a compromise was reached, and the UCC found its way into the set of Directive Principles. Through this exercise, Hansa sought to safeguard the civil rights of women from the interpretation of religious texts that found favour among orthodox, yet influential, members of the community. 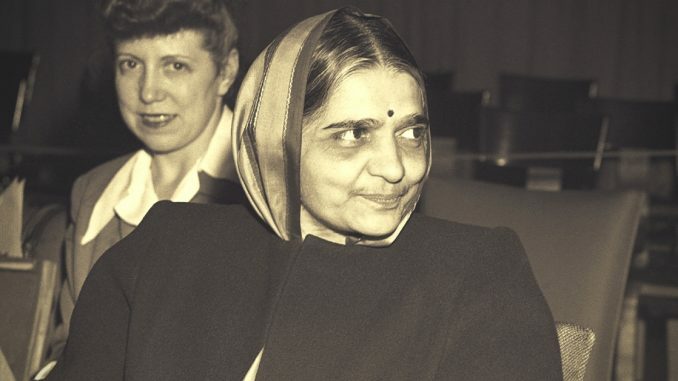 “Mehta played an integral role in a women’s movement that pushed for the abolition of child marriage (the Sarda Act) as well as the devadasi system, for better educational opportunities for women, and personal law reforms,” says this Mint profile. On the reforms suggested by Dr Ambedkar for the Hindu Code Bill on contentious issues of property rights, inheritance laws, divorce and adoptions, Hansa issued her support. However, imperfections did remain, and she acknowledged it in a subsequent speech. “This Bill to codify the Hindu Law is a revolutionary Bill and though we are not quite satisfied with it, it will be a great landmark in the social history of the Hindus. But since this Bill was drafted, many things have happened, and one of the biggest things that has happened is the achievement of our political freedom. The new State is going to be a democratic State and democracy is based on the equality of individuals. It is from this point of view that we have now to approach the problems of inheritance and marriage, etc., that are before us,” she said. As the clock struck midnight on August 15, 1947, Hansa presented the newly-independent nation’s first national flag on behalf of its women. “We have donned the saffron colour, we have fought, suffered and sacrificed in the cause of our country’s freedom. We have today attained our goal. In presenting this symbol of our freedom, we once more offer our services to the nation,” she said. Following Independence, she served in the United Nations Human Rights Council, on the board of the United Nations Educational, Scientific and Cultural Organization (UNESCO), and her husband Jivraj Narayan Mehta went on to become Gujarat’s first chief minister. She also went onto become the vice-chancellor of a recognised Indian varsity in the Maharaja Sayajirao University of Baroda. Her legacy as a freedom fighter, reformer, educator and staunch champion of women’s rights was cemented with the awarding of the Padma Bhushan in 1959.